Autumn is here and so are cold and flu. My neighbor was down past weekend with strep throat and sinus infection, ugh! I hardly could hear her voice when we were talking on the phone. I remembered last year when out of nowhere, I got phenomena! Even my fiends were asking “Who gets phenomena these days, especially in the Spring? !” Well, I did. All I wanted to do was to stay in bed and do nothing. When I was a kid, it was customary for neighbors to occasionally bring some homemade food to one another. Anything could be an excuse to stop by, say hi, and offer some nice and warm meal to a neighbor. One day it was their son’s or daughter’s wedding, another day they had a new baby in the family, the next day their kid was going away to college, or simply one of the neighbors was sick and needed some love and care. Maybe I was born one or two decades too late but I think it was a nice gesture, human and heartwarming. In a large pot, heat the oil and fry the onion, garlic until golden, then add the cumin, turmeric and ginger and stir for a few seconds. Add the chicken, beets, half of the water and let them cook in the pot with the lid on for about 15 minutes. Add the rest of the ingredients and let them cook for about 15 or 20 more minutes. 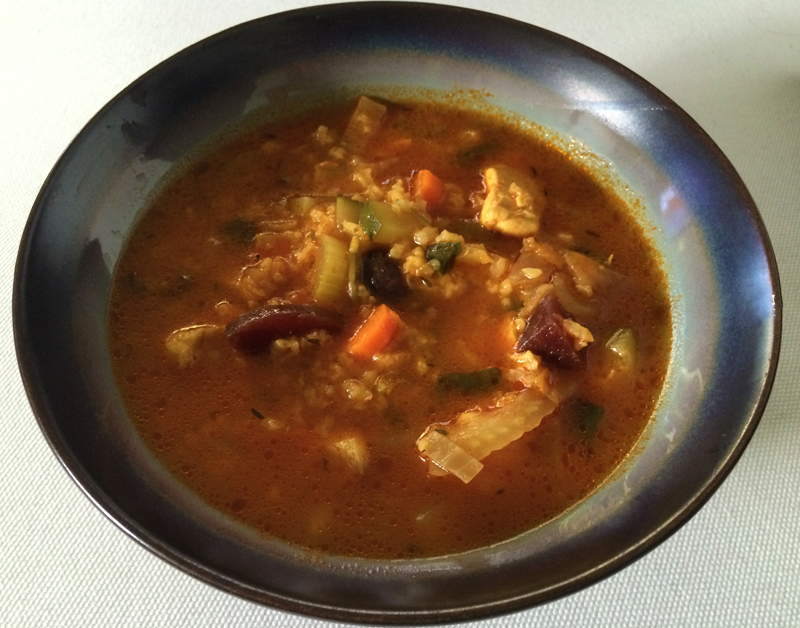 This entry was posted in Gluten Free, Healing, Health, Life, Recipes, Soups & Salads, Uncategorized and tagged Comfort Food, Food, Health, Life, Minestrone Soup, Recipes, Soups. Bookmark the permalink.